272 pages | 36 B/W Illus. This book examines monetary policy, central banking and exchange rate regimes in the Middle East and North Africa. Part I covers central banking and monetary policy, while Part II covers monetary policy and exchange rate regimes. 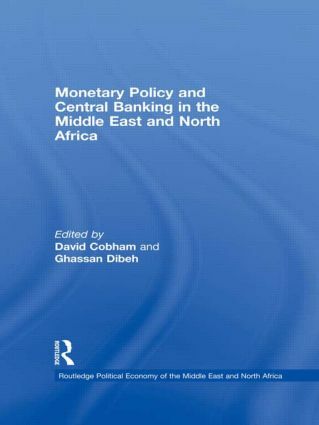 Some chapters focus on the monetary frameworks of particular countries, including Lebanon, Algeria, Syria, Tunisia, Morocco, and Turkey, outlining the different systems operated in each case, considering their successes and failures, and discussing important issues such as government policy, macroeconomic performance, inflation and inflation targeting, central bank independence and the impact of broader political economic developments on the conduct of monetary policy. Other chapters cover thematic issues across the whole region, including: central bank independence, operations of debtor central banks, the effect of exchange rates on inflation, and the effect on countries’ trade of alternative exchange rate regimes. Drawing on the insights of scholars and policy-makers, this book is a vital resource for anyone wanting to understand the economies of the Middle East and North Africa. David Cobham is professor of economics at Heriot-Watt University in Edinburgh, UK. His main research area is monetary policy, particularly the UK, but he also has an interest in Middle East economies. He has published papers in Economic Journal, Oxford Bulletin of Economics and Statistics, World Development, International Finance, and other journals. Ghassan Dibeh is currently associate professor of economics at the Lebanese American University in Byblos. He is the editor of Review of Middle East Economics and Finance. His research interests include macroeconomics, political economy, financial economics and econophysics. His papers have appeared in Physica A, Review of Political Economy, Energy Economics, Journal of International Development and Middle Eastern Studies. The Middle East continues to dominate in the news and current affairs coverage of the media both in global and regional contexts. Despite this growing and intensified interest in recent years, it is widely recognised that the region is largely underrepresented in a range of disciplines in the scholarly and academic domains. Routledge is proud to have launched this series since 2003 to widen in-depth analyses and understanding of the economic and political dynamics of this important region. The aim of the series is to publish both specialist and more general titles covering a wide range of issues relating to the political economy of the Middle East and North Africa region. It will feature the latest political economy studies of the Middle East defined to encompass countries from Morocco to Iran. Submissions from prospective authors are welcomed, and should be sent in the first instance to the series editor (hh2@soas.ac.uk). The series will be open to single-authored books as well as edited volumes and textbooks. All manuscripts will be subject to international standards of peer review.